d history review. I mention the experimental nature of this post because it has been a real learning process in planning and blogging. A few minor planning details (such as leaving 3 beers all of 16oz or more to finish on the day of the post) and getting a head cold threw off my Wednesday posting date. No worries however I have successfully drunk my way through some excellent Oktoberfest (and Oktoberfest “styled”) beers and will give you all of my thoughts. Additionally I want to provide you with a brief history of how this festival came about and why I love this time of year so much. pe of yeast used. All lager beers are brewed the same as ales, but when it comes time to add the yeast, brewers choose a specific lager strain that will ferment at cool to cold temperatures near or just above freezing and require a much longer fermentation period, many weeks or potentially months depending on the beer. The resulting lager beer can vary in color just the same as an ale, but it’s taste is often more subdued with less aromas and flavors being imparted by the yeast. This reduction in flavors and aromas plays significantly into the success and marketing of macro breweries, but we will discuss that another time. ves and cellars had to be consumed to make room for beer from the coming harvest, there was a lot to get rid of. As you can probably imagine, finishing a lot of strong and moderately hoppy (the hop flavors mellowed with the summer lagering) beer around harvest time was a cause for celebration and merriment. Can you start to get a picture of how the modern Oktoberfest celebrations came to be? So to spare you much more history and get on to the reviews, let me fast forward a little more than an century and a half and just mention my interactions with Oktoberfest here in America. I have always enjoyed early fall because the temperatures are generally mild, the fall colors are beautiful, I love the smell of wood fires, and there are plenty of great fall celebrations. Not the least of which for me was La Crosse, Wisconsin’s Oktoberfest celebration. This is one of the largest Oktoberfest celebrations in the U.S., drawing in 150,000+ people during the opening weekend and was something I grew up with. I could go on and on with stories about the festival, but I’l just say that I have missed only a few in my life and that it is a special event for coming together with friends, family, drinking beer and enjoying the community in La Crosse. Taste– Sweet caramel malt up front, a bit of dark fruit (plum), finishes quite sweet, but the lightly roasted malt flavor is what lingers. Overall– Lighter tasting than it looks, strong fruit aromas and smelled similar to a quadrupel style. Overall– Really enjoyed the rich, malty taste with the light fruit notes and the breadiness. Overall– Very tasty and crisp Oktoberfest. Hops are quite present and I like how the hops add some complexity to the overall flavor. The earthy/citrusy/spiciness work very well with the caramel malt flavors. Overall– Enjoyed the pumpkin aroma (not pumpkin spice, actual pumpkin). Tastes were fairly mild and pleasant throughout. Refreshing and easy drinking. Aroma-Sweet breadiness, light citrus zest, light caramel, background of noble hop spice, I notice some dark fruit aromas. Taste– Sweet lightly roasted malt, a bit of dark fruit on the end, earthy notes. Overall– Great example of the märzen style. Nice malty sweetness balanced out by a touch of hop spice and some dark fruit aromas and taste from the yeast. Crisp yet not light. Well balanced. Overall– Not a very traditional Oktoberfest bier, but that’s not what they were going for anyway. It’s their own hoppy take on the märzen style with some rye added. An great adaptation and a refreshing change of pace. Much more hoppy that the other Oktoberfests and the rye adds a nice smoothness to the body. Overall– This is the actual style of beer served at Oktoberfest in Munich so it makes sense that it is lighter in body than the others so as to accommodate drinking ein mass (a 1 liter glass stein). Enjoyed the bready character of the beer and the light spiciness from the hops. At the end of the samplings my favorite of the bunch was the Ayinger Oktoberfest. It just had the balance of malty-caramelly-bready sweetness with some spicy hop aromas and flavors that fit what I think of this time of year. Schell’s was a close second and my favorite of the U.S. bunch. However, there were no losers in this bunch. Seriously, all of the beers were excellent, and I would recommend any of them to you. 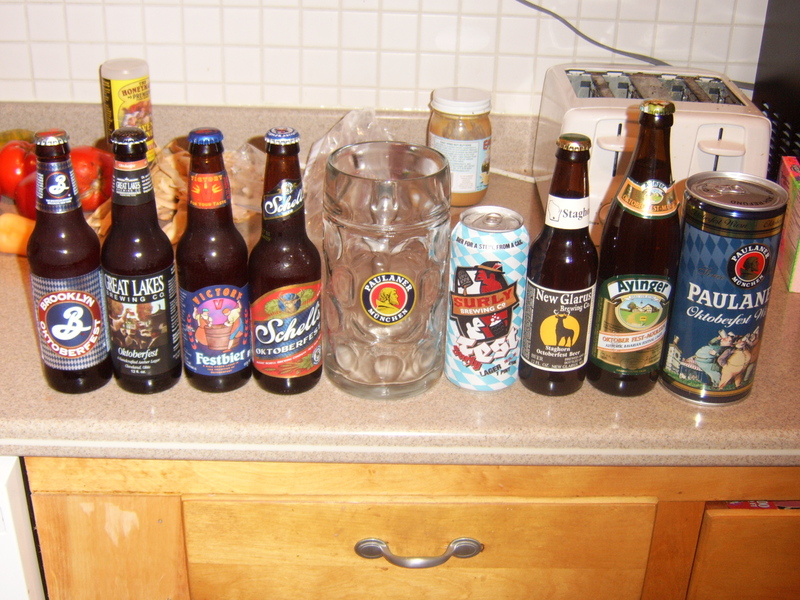 I will post individual photos of the beers before I sampled them on Flickr, keep an eye out. So do take the time to enjoy some märzen lager while you watch the leaves change colors, reminisce on the warm summer days and look ahead to the coming snow and cold (don’t worry, there are always good beers to drink no matter the weather). Prost! Next Week: We will be drinking locally! Taking a look at some of the delicious beers made right here in the Twin Cities, the first in a series of posts highlighting specific local breweries. Posted in Uncategorized and tagged ayinger, Brooklyn Brewery, craft beer, Great Lakes, history, la crosse, marzen, New Glarus, Oktoberfest, paulaner, Schell's, surly, twin cities, Victory. Bookmark the permalink. What a history lesson; bravo…ein prosit! !